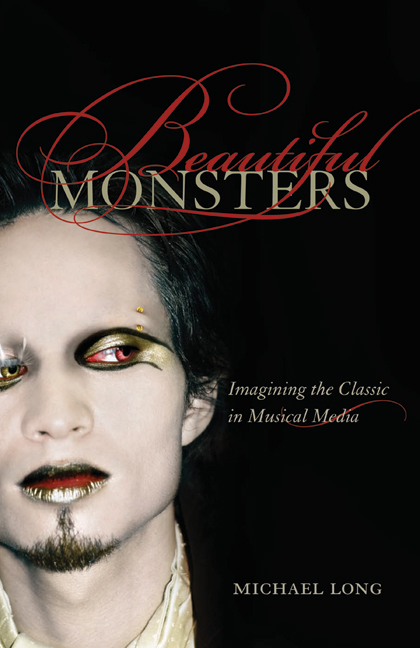 Beautiful Monsters explores the ways in which "classical" music made its way into late twentieth-century American mainstream culture—in pop songs, movie scores, and print media. Beginning in the 1960s, Michael Long's entertaining and illuminating book surveys a complex cultural field and draws connections between "classical music" (as the phrase is understood in the United States) and selected "monster hits" of popular music. Addressing such wide-ranging subjects as surf music, Yiddish theater, Hollywood film scores, Freddie Mercury, Alfred Hitchcock, psychedelia, rap, disco, and video games, Long proposes a holistic musicology in which disparate musical elements might be brought together in dynamic and humane conversation. Beautiful Monsters brilliantly considers the ways in which critical commonplaces like nostalgia, sentiment, triviality, and excess might be applied with greater nuance to musical media and media reception. It takes into account twentieth-century media's capacity to suggest visual and acoustical depth and the redemptive possibilities that lie beyond the surface elements of filmic narrative or musical style, showing us what a truly global view of late twentieth-century music in its manifold cultural and social contexts might be like. Michael Long is Associate Professor of Musicology at the University at Buffalo, State University of New York.